Peter Wagner knows firsthand just how hard it is to get people excited about a topic as seemingly dry and technical as the U.S. Census. As the executive director of the Prison Policy Initiative, a non-partisan research organization in Easthampton, Wagner has spent years trying to get lawmakers and others in positions of influence to pay attention to—and then push to change—one aspect of the complex process by which the Census Bureau counts U.S. residents. Wagner’s focus: how the Census counts prisoners, a topic he’s been studying since his days as a law student at Western New England College. The Census counts prisoners at the place where they’re incarcerated, not in the community where they lived before they were locked up. That policy results in the skewing of population data that’s used to draw up legislative districts—a “prison-based gerrymandering,” as PPI puts it—that has a direct, and detrimental, effect on the fair, democratic distribution of political power. Wagner has been studying the issue for almost a decade, and along the way, he and his colleagues have seen just how hard it is to change a bureaucracy as large and slow-moving as the Census Bureau. That makes their recent victory on the prisoner issue, while only a partial solution, a satisfying, and effective, step in the right direction. The 2010 Census currently underway will count prisoners as it has for years: at the institutions where they are incarcerated, not at their most recent home addresses. The difference is what the Bureau will do with that information. Under a new agreement, data on prison populations will be published several months earlier than planned, which will allow individual states to use it as they begin their legislative redistricting processes. That might not sound like much—a government agency releasing a relatively small amount of its collected data a little earlier than usual. But the consequences will be significant, making it easier for states to ensure that their legislative districts are fair representations of actual populations. Decisions about where prisoners are counted are significant, given the large number of people behind bars in the U.S. According to the federal Department of Justice, there were 1.5 million people in state and federal prisons in 2008 (an increase of more than 200,000 from just a decade earlier). Another 800,000 people were locked up in local jails, up 300,000 from 1998. 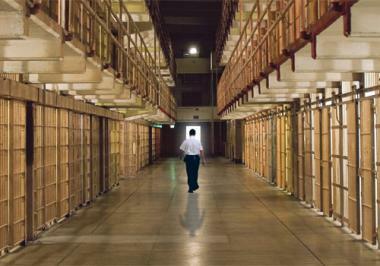 In Massachusetts, there were just over 10,000 people in state prisons in 2009, according to a report by the Mass. Department of Corrections. The state’s one federal prison, Fort Devens, has about 1,300 prisoners, according to the Federal Bureau of Prisons. Those people are all counted by the Census as living at their jails and prisons; that data, in turn, is given to states to use as they draw legislative districts. In its research, PPI points to perhaps the most dramatic example of how this process can go awry: it comes from Anamosa, Iowa, a small town whose total population of 5,700 includes the 1,300 men locked up at the state penitentiary located there. The prison dominates the Anamosa City Council’s Ward 2, accounting for all but 100 residents in the district. But because in Iowa (as in 47 other states) convicted felons cannot vote, only the 100 non-prisoner residents of the ward were eligible to select their city councilor—meaning those 100 people had as much representational clout in city government as the 1,400 residents who made up each of the city’s three other wards. And it wasn’t just those residents who were poorly served by the formula. Because the prisoners were not counted at the homes where they lived before their arrest—and where, it can be assumed, many would return upon their release—those communities also suffered, as their population count, for the purpose of distributing political representation, shrank. After a 2006 election in which Ward 2’s councilor was elected by just two voters, Anamosa voters opted to right the imbalance by changing their governmental structure: starting last year, all city councilors there were elected at-large, rather than by ward. While Anamosa has found a solution, the problems caused by the Census’ policy for counting prisoners remain in many other places. Wagner and his PPI colleagues have found examples of this imbalance in political representation in a number of states, including California, Illinois, Maryland and Texas. In New York, Wagner’s research found, the imbalance splits along urban/rural and white/non-white lines. While 91 percent of the state’s prison cells are located in upstate New York, two-thirds of prisoners come from New York City. That means that the upstate region, which already relies on its prisons as a much-needed economic engine, also benefits politically, thanks to the inflated population figures created by the prisons. According to PPI, seven state legislative districts in upstate New York would not meet the minimum population requirement were it not for prisoners. Meanwhile, the urban areas from which the majority of those prisoners hail lose in their population count—and in political clout. In Massachusetts, a 2009 PPI report found, five state legislative districts only meet the minimum number of residents required for a district because they include a local prison population. Three are in eastern Massachusetts, and one is in Worcester. Locally, the 7th Hampden district—currently represented by state Rep. Tom Petrolati, a Democrat and speaker pro tempore of the House—only meets the minimum because it includes the Hampden County House of Corrections in Ludlow. “The actual population of this district is more than 8 percent smaller than the average district in the state, giving every group of 92 residents in Ludlow and some of the surrounding areas as much political power as 100 residents elsewhere in the state,” the PPI researchers wrote. While convicted felons cannot vote in Massachusetts, a number of inmates at the Ludlow jail—those awaiting trial, those there for misdemeanors—do have the right to vote. But with the exception of those who also happen to be residents of the 7th Hampden, most of them are, nonetheless, credited to the wrong district. As in Anamosa, some communities and states have opted to circumvent the problematic Census data when drawing legislative districts. In Gardner, Mass., for instance, the City Council voted in 2001 to exclude prisoners at North Central Correctional Facility when drawing up councilors’ districts. Nine states are also considering legislation that would amend how prisoners are counted for the purpose of legislative redistricting. Bills have been filed in both Connecticut and Rhode Island that would count prisoners at their last pre-prison address for redistricting purposes. The earlier publication of the Census’ prison data will makes things much easier for governments that want to take prisoners out of the redistricting equation. “[S]tates can use it in conjunction with their own data to assign incarcerated people to their home addresses, or assign prisoners to an unknown address so that they do not affect the redistricting formulas, or leave the prisoners counted where the prisons are,” PPI noted in a recent report. In the past, the federal data was released too late to be of use in local redistricting processes; the early release, in 2011, will mean most states will have it time. The Census Bureau agreed to the change in response to pressure from U.S. Rep. William Lacy Clay, Jr. (D-Mo. ), who chairs the House subcommittee on Information Policy, Census and National Archives.